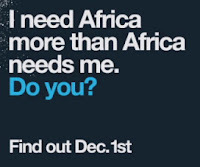 Remember last week when I talked about how I need Africa more than Africa needs me? I promised you more information from Mocha Club about this amazing campaign and today, it's here! Read below and please click the links to watch the video and go to Mocha Club's website and see what this is all about! Comment here because I really want to know what you guys think about this. There are so many other bloggers getting a great discussion going about this project...check them out here.